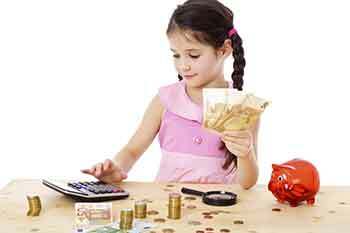 How to teach healthy financial habits to your kids? The most basic lesson about money is that you have to pay money to buy something. Nothing in life comes free. Though kids will understand it eventually as they grow older, it is important for them to grasp this concept at a very young age. One of the biggest oversights in our education system is the fact we don’t have curriculum teaching children about money from a young age. It is even more surprising when you see that as adults they are least aware of this important part of their lives. Hence, as parents, it becomes your duty to educate your children about money to prepare them for the future. Parents can help them understand that financial decision-making is a necessary quality from a young age. While it is never too late to explain to your child about the money, you can’t explain credit cards and loans to a 5-year-old. You have to take baby steps towards educating them in stages. This will help them grasp the concept of money from a younger age and understand it better. Teach them about the value of each note and coin by telling them the prices of everyday household things. For example, a toffee costs Rs. 1 but a larger chocolate costs Rs. 20. Now that your child understands the value of money for different products, the next step is teaching them the basics of savings and expenditure. You can give your child an allowance every month and ask them to split the money and put it into two jars – a spending jar and a saving jar. Discuss out loud and analyse together whether you really need a particular product or if you could do without it. This helps them understand not to buy products just because they are on sale. When your child is in their teens and on the cusp of leaving school and entering college at the right age to learn to about banks, interest and the benefits of saving money sooner rather than later. Take your kids to the bank and open a minor Savings Account for them. Teach them about interest rates, compound interest and how you can make more money by saving at a young age. Ask your child to save for that guitar or cricket kit that they have always wanted. Since they are slightly expensive, your child will learn to say ‘no’ to unnecessary expenditures like chocolate to buy something he is more passionate about. Now that your kid is in his late teens, it is essential to be open and discuss college-education expenditure. Be upfront in telling your kid how much of the expense you can handle so that they don’t have unrealistic expectations about college. Ask your children to check out different colleges and the total expenditure including fees, hostel charges, food charges, etc. Teach them about scholarships and student loans so that they can make an informed decision instead of getting discouraged by the course fees. This way your child will learn about loans, debts, EMIs, etc. As your child steps into adulthood, explain the concept and the workings of credit cards. You need to clearly explain that they should use a Credit Card only if they can make a full repayment during the next payment cycle. Let them know, ill-advised expenses and over-spending might see them paying hefty interest with each passing month. It is never too late to help your child grow up into a mature and responsible adult with knowledge of the world.